Too often, finance courses stop short of making a connection between textbook finance and the problems of real-world business. Financial Modeling bridges this gap between theory and practice by providing a nuts-and-bolts guide to solving common financial models with spreadsheets. 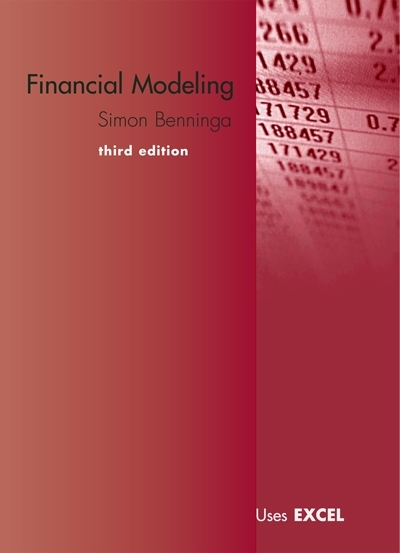 Simon Benninga takes the reader step by step through each model, showing how it can be solved using Microsoft Excel. The long-awaited third edition of this standard text maintains the “cookbook” features and Excel dependence that have made the first and second editions so popular. It also offers significant new material, with new chapters covering such topics as bank valuation, the Black-Litterman approach to portfolio optimization, Monte Carlo methods and their applications to option pricing, and using array functions and formulas. Other chapters, including those on basic financial calculations, portfolio models, calculating the variance-covariance matrix, and generating random numbers, have been revised, with many offering substantially new and improved material. Other areas covered include financial statement modeling, leasing, standard portfolio problems, value at risk (VaR), real options, duration and immunization, and term structure modeling. Technical chapters treat such topics as data tables, matrices, the Gauss-Seidel method, and tips for using Excel. The last section of the text covers the Visual Basic for Applications (VBA) techniques needed for the book. The accompanying CD contains Excel worksheets and solutions to end-of-chapter exercises. This entry was posted in Books and tagged financial modeling. Bookmark the permalink.